Frolik has collected eight points in seven games since being a healthy scratch for the Western Conference-leading Flames, who have won four straight games and are riding a 7-1-1 roll. With his team down 2-0, Frolik kicked off the Calgary comeback at 10:14 of the middle frame when he deflected Mikael Backlund’s shot for his 11th goal of the season and fourth in six games. Mark Giordano tied the game at 2-2 five minutes later, wiring a top-shelf shot for his seventh goal of the year after receiving a cross-ice pass from Frolik. Evgenii Dadonov scored with 20 seconds remaining in regulation to trim the deficit to 4-3. The struggling Panthers staked goalie Roberto Luongo to a 2-0 lead by the early moments of the second period, but they couldn’t hang onto the lead for the second time in as many nights. Florida led three times Thursday at Edmonton but lost 4-3 in a shootout. 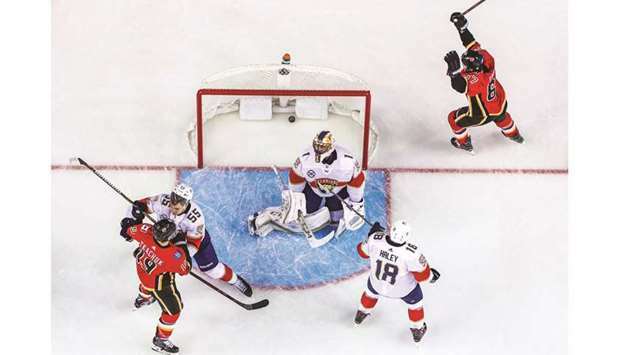 On Friday, the Panthers’ Mike Hoffman opened the scoring 6:18 into the first period with a gift goal. Jake Guentzel had a hat trick, and Phil Kessel delivered the go-ahead goal in the third period Friday as the visiting Pittsburgh Penguins rallied from a three-goal deficit to earn a 7-4 victory and send the Anaheim Ducks to their 10th consecutive defeat. Tanner Pearson scored a pair of third-period goals as the Penguins won for the 10th time in their past 11 games, a run that started after they lost a 4-2 decision on Dec. 17 at home to the Ducks. Anaheim has not won since that date, going 0-7-3 and dropping all six games on their-just completed homestand (0-3-3). Kessel scored the game-winner unassisted at 10:22 of the third period, when he forced a Ducks turnover in the Anaheim zone and beat goaltender John Gibson for his 18th of the season. Pearson had just tied the score 3-3 less than a minute before Kessel’s goal. Evgeni Malkin fed him the puck from behind the Ducks’ net, and Pearson delivered to the short side of the net. Pearson’s insurance goal, his eighth of the season for a 6-4 lead, came with 3:25 to play. Daniel Sprong scored against his former team, delivering the last of Anaheim’s three first-period goals. Sprong, traded to the Ducks from the Penguins in December, scored for the sixth time in 16 games with his new team. Nick Ritchie and Ryan Getzlaf also scored in the opening period for the Ducks. Guentzel scored twice in the second period as the Penguins tied the score 3-3. Malkin also scored in the second period, his 14th of the season, and he contributed three assists on the night. Kessel had two assists. Guentzel added his third of the night into an empty net with less than a minute remaining. Jakob Silfverberg scored in the second period for the Ducks, his 12th of the season. The seven goals were the most the Ducks have allowed this season. Their 10-game losing streak extended the longest such run in franchise history. The Ducks will now play at home just once in the next 33 days. The Penguins won the opener of a five-game West Coast road trip that continues Saturday at Los Angeles against the Kings. The road trip will lead Pittsburgh into the All-Star break.